In my previous articles, I provide warnings to managers who rely on indirect sources of information about employees’ performance in providing performance feedback. 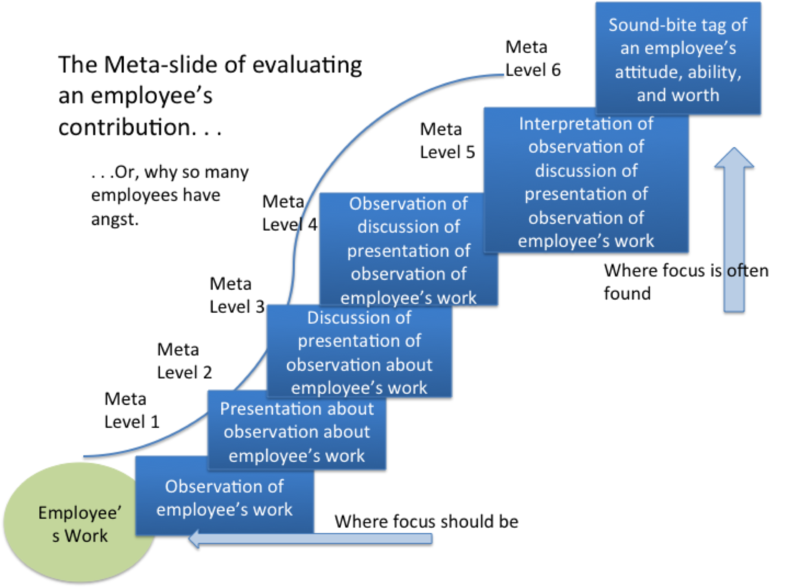 I generally advocate that a manager use direct observation to provide performance feedback, as this is the path that most likely will generate improved performance. Relying on indirect sources tends to erode trust and is often very confusing. I provide some tips on what to do about “indirect sources” here. But there are times when you receive some sort of feedback about your employee’s performance that doesn’t allow you to wait until you can notice a trend and/or perform more direct observation. A common scenario is when you receive a complaint from a customer about something one of your employees has done. So let’s talk about what to do in this scenario! 1. Get info from the customer about what happened. When a customer complains to you about what the employee did, try to get the points of fact about the situation, what was said and done during the situation, and where things stand now (has the issue actually been resolved, or does it still need resolution?”) Often with complaints – and if you are speaking directly with the customer – the details are fairly fresh in the customer’s mind – and usually given right away after the situation, so it is possible to get fairly specific quotes about what your employee said, specific info about what your employee did. Try to write these quotes/actions down and understand as many of the “facts” of the situation possible. Of course, if you receive this complaint indirectly (like via a survey), then this option is not available. This is the latest in a series of articles on what inputs a manager should provide performance feedback on. The three best sources are practice sessions, direct on-the-job observation, and “tangible artifacts”. The reason these are the best input to provide performance feedback on is that these are the closest to the performance, hence performance feedback is possible. The intent of providing performance feedback is that this feedback will help performance improve. The better the feedback, the more likely the performance is going to improve. After “tangible artifacts,” there the are lots of other thing that employees produce — and managers receive a lot of input about an employee from these – but, as the label implies, these are less tangible (see this article for a general overview) and therefore less useful for providing performance feedback on. So let’s talk about perhaps the most common of these inputs, what I call “intangible human-based” artifacts and how managers should use them. There are intangible artifacts related to the people they work with that an employee produces. These are things like “relationships” or “valued customers” or “buy-in from a partner” or “sales.” These are all human-based outcomes that the employee can “produce,” and in many jobs, these are the thing that the employee must produce. Imagine walking in at the end of a dance performance. The performance is over and you see the crowd stand up and clap and yell, “Bravo!” The dancer created the intangible human-based artifact of the “delighted audience.” Awesome!